On the alt-liberal left--a "radical Islamist" leaning and violent Antifa. On the ultra-conservative right--Neo-Nazi and White Supremacists. And in the middle (regardless of political beliefs)--good people of faith and integrity with seemingly nowhere to turn. Great weapons will be released and a very great cleansing of man's hearts will occur. I don't understand the call for a gathering--aren't we safer perhaps spread out? Perhaps the gathering refers to G-d's promise to gather His people from the four corners of the Earth. 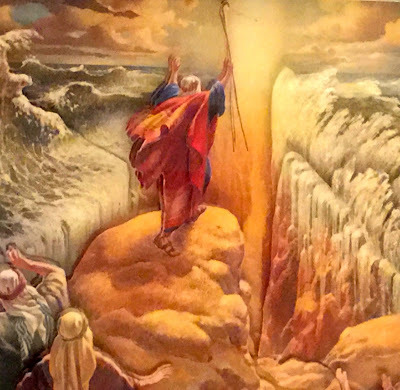 - And they will walk the sacred middle ground through the Red Sea to the promised Holy Land. They have "split" from normal thinking and doing the correct thing--they have gone over the top! A new righteous center--driven by faith and a moral compass --desperately needs to emerge now.